Putting this all back together is much easier than pulling it apart. The hardest part is squeezing the hog rings back in place. This is much easier done with hog ring pliers, but needle nose plies can work. I place the hog ring on both skin and seat and then use the pliers to squeeze the ring back together. Remember to attach the two long metal clips on the seat before putting tightening the front hog rings. Once the skin is back on, place the metal tray back on the seat and reattach the two clips. Start with the front center of the seat and start pushing on plastic trim. You may need a small hammer! Once you get the U shaped trim on, pull the leather tight and attach the two side trim pieces. Now attach the rear trim piece. Attach the bottom seat to the lower frame and then attach the lower frame to the rest of the seat. Do not over tighten any of the bolts. They can strip very easy! Especially the four bolts that attach the seat to the car. 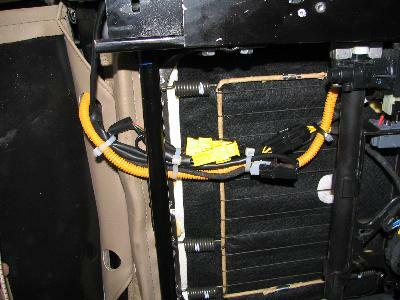 Tie wrap all of the wires so they do not rub as the seat moves back and forth and attach the bungee for the rear flap. Finally, reinstall the seat into the car and attach the side pod. Plug in the main seat plug and reconnect the car battery. 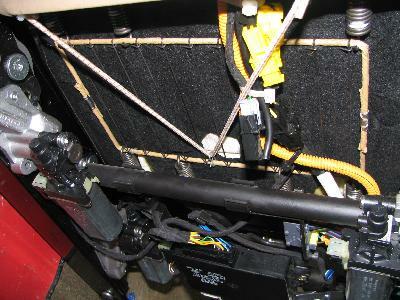 Move the seat back and forth to reinstall the 4 main bolts. Now sit in your seat and feel the warmth!